The reality is a bit different. Both our main testers (Mark and I) started riding seriously on racing bikes. Mark had a Cannondale; I had a classic Bianchi and later a Marinoni. 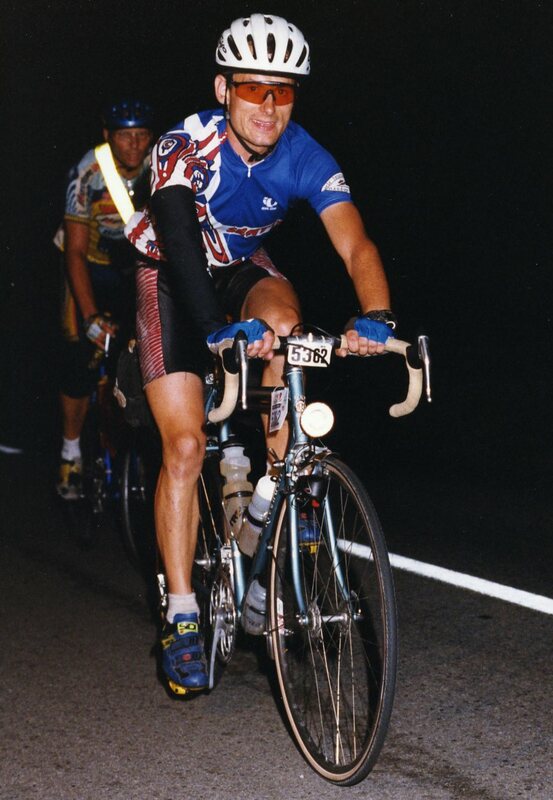 Mark rode triathlons; I raced for 10 years and did some triathlons and cyclocross as well. I even toured on my racing bike. We selected the best components for our bikes, and we both were convinced that we owned the best bikes in the world. 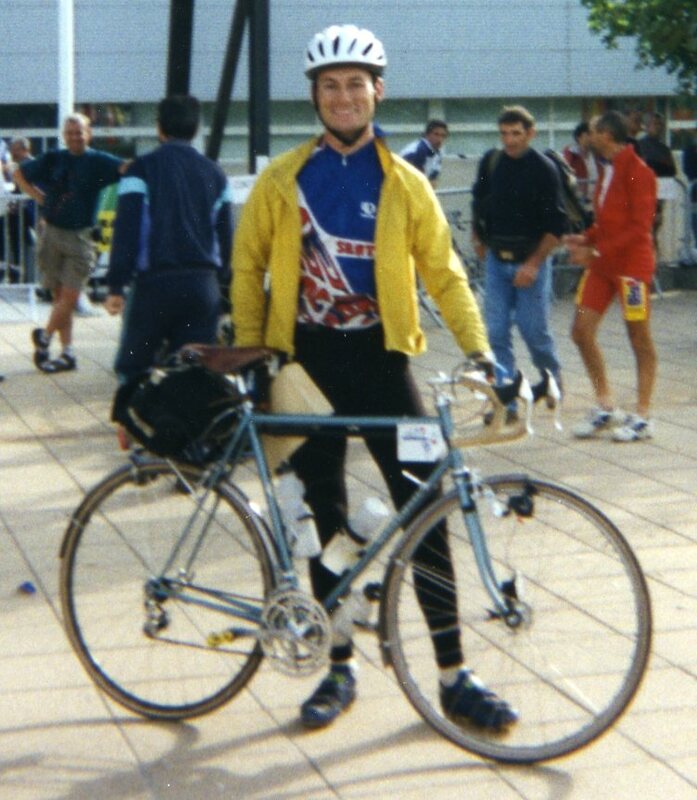 I rode about 20,000 miles on my bike, including the 1999 Paris-Brest-Paris (see photo above and top) and many brevets and long-distance races. Mark rode at least as far on his machine. Those were the bikes we rode when Bicycle Quarterly got started almost nine years ago. We still have those bikes. They still are very good machines, but the bikes we enjoy most these days are quite different. over a short period of just 8 or 9 years? It has been a remarkable journey of discovery, which we’ll share in this series. How have your preferences changed in recent years or decades? This entry was posted in A Journey of Discovery, Our Bikes, Testing and Tech, Uncategorized. Bookmark the permalink. I also went through a “change of preference”. Coming in from other sports–basketball, and running, most notably–I got into cycling seriously as a shift in exercise to save my injured knees. I initially looked for equipments that pro athletes in the sport use–just as I would buy a pair of Air Jordans to play basketball. I rode on racing bikes for 2-3 years, and would probably continue on that path longer until I rode my friend’s Rivendell when I left my bike at home for a bike ride. 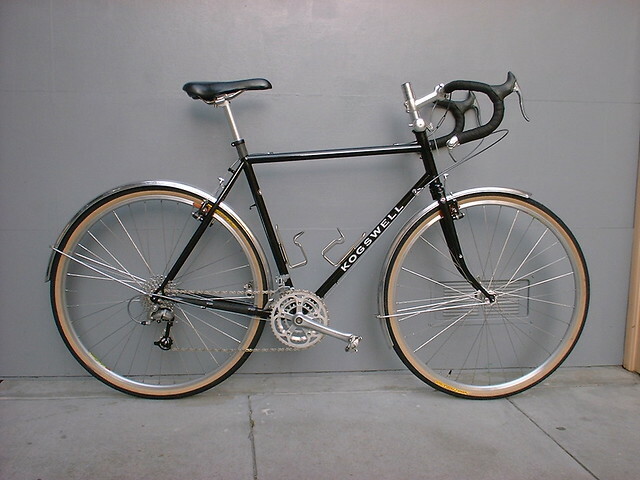 I went on Rivendell’s path for 3-4 years–wider tires, leather saddle, high stem, lugged steel construction, stout construction. I began to look more closely at my bike preferences when I began riding brevets and thinking about ordering my Ebisu from Jitensha Studio. I went with Jan’s advice for the 650b version of my Ebisu and asked Hiroshi Iimura for standard-sized tubing. While I was waiting for the Ebisu, I got a standard-tubing, 650b Kogswell P/R, and the handling and the feel of that bike was a revelation. Later, when I received my Ebisu, I was glad that I went with the wheel size, the tubing, and the front geometry (Hiroshi designed the front end to be around 45mm trail). The Ebisu was more refined and has many nicer details than the Kogswell, but the general feel is similar. 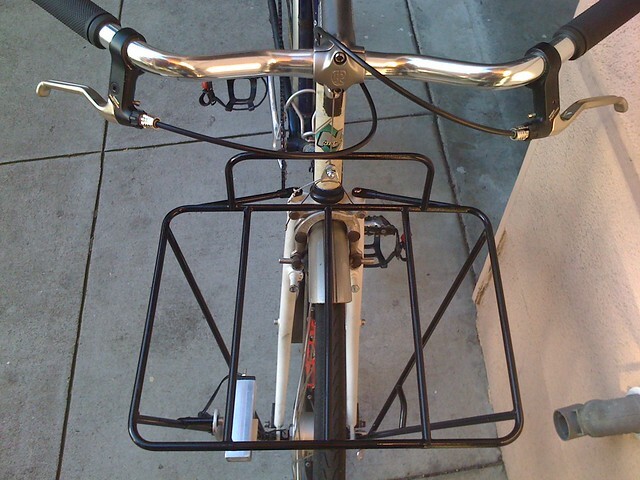 Besides the handling and ride feel, I have also come to appreciate and demand accommodations for metal fenders and front racks on my bikes, which my newer bikes were able to address better than my Rivendell. A nicely rendered Rivendell still stops me on my track, and I now own a 650b Rivendell for riding on rougher surfaces, where its stouter tubings give me more peace of mind, as my 200lb+ body might be too punishing for my standard-tubed bikes. Rivendell really was instrumental in pointing many of us in the direction of wider tires, (slightly) higher handlebars, the importance of comfort and the experience over speed alone… Today, Grant Petersen’s ideas have been accepted to widely that it’s easy to underestimate how influential they were in the early- and mid-1990s. I’ve been waiting to hear this story for years! I too ride a high trail, wide tired 700c (Cross Check) with a then “perfected” road triple and mountain rear transmission, Carradice bag, and bar-cons. I’ve been reticent to switch frames because of the cost and because no one makes a 700c low trail bike that will take Surly style wide tires. Every other affordable frame comes with trade-offs that in my mind would be non-negotiable(!). The other thing I’ve found is that among a stable of bikes, I’ve been able to economize a little by using the same bags and sometimes wheelsets between bikes. Having a handlebar bag for one bike that doesn’t work on other bikes that get at least as many miles (because of load carrying capacity, cellos and kids for instance) as my “long distance ride” doesn’t make as much sense. It’s never been easy to know if 700c shows the same benefits with similar geometry, what trail range works for which loads in that wheel size, or whether loading with conventional bags or riding without weight in the front wrecks this “low trail” geometry as has been expressed at times in discussion. Therefore, I wait and observe and with each new issue of BQ, I, as well as many of our friends, take a dimmer view of our traditional steeds. Here’s a thought: would Compass Cycles ever import or sell a 65 mm offset 700c lugged fork that would replace the 45 mm offset/400mm axle to crown standard fork that one finds for most all cross and touring bikes? One can always dream. Does your research support such a need? Other than that, great job Jan, and thanks for making all of our bikes seem so drab. Keep up the great magazine and I look forward to riding with you again. One thing to remember is that all bikes are fun. Some of my most memorable rides were on my racing bike, loaded up with rear panniers, for a weekend tour to visit a friend hundreds of miles away. We all ride and enjoy what we have. Only when it’s time to get a new bike should we think carefully about whether there is something better out there. Fortunately, most of the changes we want in a bike don’t cost much. For a maker, it costs the same to build a bike with one geometry as with another. A front bag costs the same as a rear bag… We have been publishing the results of our research to give builders and makers the tools to make better bikes. This will be a great series of posts and I’m looking forward to the rest of the story, although I think I’ve heard it most of it in person from both of you over the years. 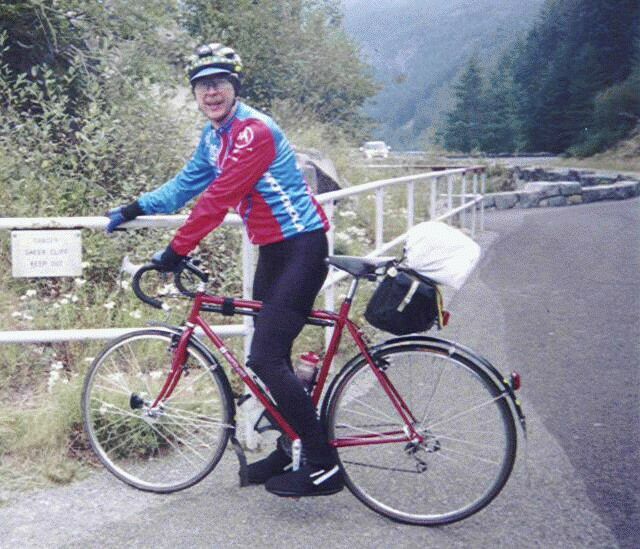 BTW, that picture of Mark our 2001 October trip to Rainier brought back some nice memories. The descent in the ice storm is when we figured out why they do RAMROD in July! I think it is great that you are supporting the bike design concepts via your reviews. I guess I am hoping that enough people in the marketplace listen so that we can get some economies of scale on production. I am not a bike mechanic and don’t want to be one. The builders that you mostly review produce beautiful hand-crafted machines but they are outside of my budget. It is a shame that you can go down and buy the latest racing bikes for a fraction of bikes that I would want to ride. Would love to hear your thoughts on whether the traditional geometry is being considered in a more production / pocket-friendly way. If one confines himself to relatively inexpensive production bikes, there is always post purchase modification. I had a Salsa Vaya modified by having the fork bent from 45mm offset to 63mm offset. That increased the head angle from 72.0 degrees to 72.4 degrees while decreasing trail to 46.5mm (with 700x40c Conti Avenue Semi Slicks). Preliminary tests with full touring rig were extremely favorable. I am currently preparing for a cross country ride, at least part way with my wife. I am considering getting her a 52cm Surly Long Haul Trucker. Standard geometry is 71 degree head angle with 45mm fork offset. If I get one and have the fork bent from 45mm to 60mm, I estimate I will have a 71.3 degree head angle and 46mm of trail with 26×1.75” tires. I too am looking forward to the rest of the story. One of my frustrations with the understanding geometry comparisons is that I (and, I imagine, many other riders who don’t live in larger cycling-friendly metropolitan areas) can’t actually test-ride the bikes. The BQ style goes a long way to cutting through the typical vague anecdote that generally passes for bike reviews; that approach combined with your personal accounts won’t substitute for physical experience, of course, but the details will help make my imagination more accurate. If along the way you can address riding conditions to which you think higher-trail bikes are particularly suited, or even preferable to lower-trail designs, that would be great. The common geometries must have arisen to meet some needs, real or imagined. Trail has gone up since the 1950s as tires have become narrower. With a narrow tire and a light wheel, you need more trail to make up for the lacking stabilizing force of the tire (“pneumatic trail”) and wheel (gyroscopic stability). Most older racing bikes would be considered low-trail today. When I measured the bikes for our book The Competition Bicycle, I found that Fausto Coppi (1949) rode a bike with about 31 mm trail. Magni (1949) had 37 mm trail. By 1965, a Cinelli Supercorsa had 45 mm trail. Eddy Merckx’ (1974) had 51 mm trail. Hampsten’s Landshark (1988) had 57 mm trail. During this time, tire sizes went from about 30 mm to 20 mm… Of course, there were many outliers in this evolution, but the general trend is clear. Jan, the lead in to your write up was intriguing. From reading BQ and your other writings over the years, it seems clear: 1) that you’re a Francophile/enthusiast for things French (and in having lived in Paris myself, I’m well aware of why that would be true), and that you’re interested in the historic side of cycling. Surely you’re not arguing that these interests don’t have an impact on your perspective on bicycle design? When I started riding seriously, I replaced my Peugeot 10-speed with a Bianchi equipped with full Campagnolo. The Campagnolo components were a revelation compared to the cheap Simplex/Weinmann/Rigida parts on the Peugeot. The lightweight frame performed much better than my Peugeot, too. I had intended to use the Peugeot for touring and commuting, but in the end, I rode that Bianchi everywhere, even with panniers when I went touring. Based on my experience with the Peugeot, I was convinced that French bikes weren’t much good. My “Francophilia” evolved over time, as I learned more about the randonneurs and their bicycles. This “journey of discovery” is the topic of this series. It is hard to describe how much I enjoy reading BQ. I do not consider the tests you guys conduct “scientific,” as to me their biases are plain, but that does not detract from my enjoyment of the magazine. Descriptive comparisons that acknowledge the subjectivity of one’s perspective are in many ways more valuable than scientific tests anyhow. As for my own experience, I began riding a bicycle again as an adult only 2 years ago. During that time I have learned a great deal, but you simply cannot cram real knowledge into such a short period of time, and I do not pretend to be knowledgeable – only on my way to maybe, in the future, being knowledgeable. I read a lot. I ride a lot. And I try not to form judgments too quickly. I own a 650B Rivendell, which I acquired 9 months ago and cannot imagine a more comfortable bicycle. I also own a couple of vintage Italian racing bikes, which I like for shorter rides. And I commute on an upright “loop frame” bike, which is another thing entirely. I find many different bikes interesting, and would love to try a true randonneur with low trail geometry in the near future. We try to keep our tests as scientific as possible. I don’t think anybody will argue that our tests of rolling resistance or our double-blind tests of frame stiffness are not scientific. They were designed by scientists, and followed a rigorous scientific protocol. If we have a bias, it’s that we prefer a bicycle to be enjoyable to ride over any road, any distance, and in any weather. But when we test a racing bike, we obviously test it as a racing bike, rather than expecting the above. There are many wonderful bicycles of many different types to enjoy, and aesthetic preferences also play a role. I am glad you appear to enjoy your bikes so much. Let’s agree to disagree? I am a scientist as well (PhD + 6 years of research experience, and I have taught university courses on experimental design). Sometimes people just don’t agree on these things, and I think that’s okay. As someone who self-publishes, you are particularly vulnerable to this criticism, but even studies in peer reviewed academic journals will sometimes inspire debates like this. As a scientist, you know that blanket statements of “bias” are neither helpful nor scientific. If you can point out where our methods are flawed, or where our data does not support our conclusions, you absolutely should. We’ll publish your concerns, as we all strive to improve our understanding of bicycles. In fact, we are probably the only cycling journal that tries hard to have our studies peer-reviewed by experts in the field. Regarding suggestions for how to improve the tests: I don’t think you can, without making them tedious or overly time consuming. I think your tests are fine, and my suggestion would be only to adjust your claims regarding what the tests prove. Hm…. What about the Pegoretti Love #3? We criticized the Pegoretti Love 3 for providing a harsh ride. We felt it rode like a Cannondale – which shouldn’t surprise anybody, as it is constructed like a Cannondale. We also felt that its very stiff frame did not accelerate as well for us as other bikes. We did not criticize the Pegoretti for its lack of fenders or inability to carry a handlebar bag. No, what I am referring to – among other things – is how you set the bike up. If I am remembering this correctly, the bicycle was a bit too large for you, so the saddle ended up being lower than the handlebars. This is not a typical racing bike set-up and the bike was not designed to be ridden in that manner, yet that is how you evaluated its performance. That sort of thing. After having tested more than 40 bikes, I have ridden many bikes with a position similar to the Pegoretti – my handlebars were about 1″ below the saddle. (The photo in BQ exaggerates the bar height, because it is taken slightly from below the bars to get the “hooks” of the bars to line up.) For me, the Pegoretti’s performance at a constant effort was great, but in a sprint, the bike was hard to accelerate. Our second tester Mark rode the bike with the saddle 1″ higher and the bars in the same place, meaning that the bike fit him “correctly.” His feelings about the Pegoretti were similar. Before we even published the test report, we offered Pegoretti/Gita to test a bike in a smaller size, if they felt that this would change our test results. They declined the offer. In the end, I suspect the commotion mostly occurred because we tested a “holy grail” of bicycles and found it didn’t live up to the hype. The Pegoretti brand has been cultivated carefully (the bikes are sold only in the US and the UK and are virtually unknown in Italy), and those behind it aren’t too happy when somebody comes along to spoil the party. Fair enough. I did not know that. The Pegoretti is certainly no holy grail for me, so I am not among those with that particular bias. I offered my bike for sale, but I had second thoughts, so I still have it. The reasons I don’t ride it that much are many – that is what this series is about. It was enlightening to read an interview with you and Grant Petersen in an older issue of BQ, where you mention that your older Rivendell bicycle has toe overlap. Before reading that, I had been under the impression that the whole point to the “magic” geometry formula of Rivendell bicycles is that they never had toe overlap. Apparently that is incorrect. My Sam Hillborne is a 650B frame and I cannot get toe overlap if I try, but now I wonder what the models with 700C wheels are like. Or maybe older Riv models had toe overlap, while newer ones do not. I am very curious about it now. I’m also looking forward to the sequel and beyond. I’ve been into the Randonneuring thing just under 6 months. And I’m doing it on a bike my father bought me when I was 13 or 14 (we can’t remember exactly when he purchased it for me). But, I’m having a frame built for the upcoming season. After growing a foot or so and spending 14 or 15 years on the same frame, it seems to be deserving. I’m looking at the low trail you suggest, and my frame builder (while not a rando specialist), has built a rando bike with super low trail (inspired by none less than BQ). While I just stumbled upon your blog, your “new” list so far has a good majority of what my new bike will, save the 650c tires and the jury is still out on triple or double front cranks. So, big changes over the last 15 years for me!! Your conclusions concerning bikes often contradict the “common truths” when it comes to what the bike-industry of today produces, and it seems to me some are very provoked by this. I have myself sometimes some thoughts about your tests and conclusions, but I think it is funny when readers argue your tests are not scientific. Of course, it is always possible to have different views when it comes to methods and conclusions, but just the plain fact you account for your methods and circumstances make your test stand out compared to most of the so called cycling press. Bias? I think there is A LOT of bias in those common truths about bicycles you find in today’s mainstream cycling world. there seems to be 2 parts to this post, the evolution of the review of bicycles as written by Bicycle Quarterly, and then a defense of the test performed by bicycle quarterly. While related, the reviews and the test as written have always seemed separate to me. I appreciate Bicycle Quarterly performing test and experiments, and then writing white papers about them. generally, from what i’ve read(or remember reading), the test generally offer the question, and the results, with no in depth analysis of the results. I don’t see the test as being very subjective, except maybe on sample size, or different ways to review for performance. The reviews of bicycles refer to the test (fastest tire, or planing, for example) but the review is completely subjective. From what I can see, Jan and Mark have very similar riding styles/body composition, etc. Since I have a significantly different power to weight ratio, do not riding a plethora of miles, and I generally do not want to buy anything french, I wouldn’t use what they say in their reviews as the definitive way to spec a $5000 custom bike. I have found the review bikes themselves enlightening to how I would want to spec a bike, since the bikes will feature little nuances magazines like bicycling and others don’t pick up on. I would like to see an indepth examination of the new triathalon/time trial bikes. these funny bikes started more then 20 years ago, and Bicycle Quarterly has looked at some aspects of this (aerodynamics, front load, and aerobars), but they haven’t looked at it as a whole. How bout it? As you point out, we have tested some factors involved with time trial bikes. For example, we found that the aerodynamic disadvantage of wider tires was too small to measure in the wind tunnel (with rider onboard). We also confirmed that aerobars offer a huge advantage – nothing new there. Beyond that, we’d need to build a significant body of experience to offer insightful tests of time trial bikes. Without riding a dozen or so different machines, it would be hard to offer a useful analysis. I am not sure our readership is interested enough in this topic to make this a worth while investment of our resources. I read a lot about low-trail bikes and finally decided that the only way to figure it all out was to jump in with both feet and try it out for myself. There’s no substitute for first-hand experience. To that end, I was one of the first buyers of the Kogswell 59x700C P/R framesets. I built it up initially with 700×35 Panaracer Paselas to suss out the “magic carpet ride”, plus I bought a cheap Nashbar front rack and modified a cheap Performance front bag to mount on that rack. Aside from the annoying shimmy problems that low trail bikes sometimes have, I was hooked! The fat tires are obviously more comfortable, but also grip tenaciously in fast downhill curves. The neutral handling does indeed eliminate that suffocating “locked in” feeling on those fast curves. Having things accessible up front in a “glove box” — not to mention having a convenient place for a map or cue sheet — proved invaluable. After a bunch of reading and other research, I’ve replaced those 700×35 tires with a set of lighter 700×32 Paselas, which seem to help the shimmy somewhat. Someday I’ll try a needle-bearing headset too, but I’ve got the bike dialed in enough for now. I’ve since added a custom front cargo rack and low-trail fork on my city bike to make it a porteur of sorts, and that bike has revolutionized my daily commuting and errand running. When I lived in SF and did all my riding in Marin County my friends and I would often ride up Railroad Grade on our road bikes. It was always a nice way to break-up a ride, be adventurous and get a reprieve from cars. I never really thought about equipment that much, 700×25 tires seemed to be fine for climbing on dirt roads and if you wanted something bigger then you got a cross bike. While I knew touring bikes existed they just weren’t even on my radar. I remember in 2003 riding with a friend of a friend who had done PBP that year and he tried to explain it to me. I just couldn’t wrap my head around it and just thought it was like a giant French charity ride. Not long after that a coworker purchased a Rivendell and really like the whole Riv aesthetic. I just remember kind of blowing him off and just couldn’t imagine riding a bike with platform pedals, a quill stem and a Brooks saddle. In 2006 I moved to Portland and a couple of things happened. First I got a Surly CC as a commuter. The Surly’s generous clearance was compelling. As I was looking for local rides I cam across the Oregon Randonneurs website and started reading about radonneuring. I was fascinated by the idea of randonneuring, it just seemed like a lot of fun without the stress of racing. I had done some mountain bike races but just never liked the idea of racing. I just wanted to spend hours in the saddle exploring the world by bike but with no desire to tour. Also, a friend signed me up for the Rivendell Reader as a “joke”. I received a Rivendell catalog which I brought to work with me one day and read cover to cover. Something clicked and few months later I purchased a Rambouillet. In the summer of 2007 the friend who signed me up the for RR as a joke came for a visit and we did this big overnight bike camping trip over and around Mt Hood. That was a turning point. We did 110 miles the first day 120 the next. It was epic. I kind of started to understand how people could randonneur and how they could cover these big distances. I was still an armchair randonneur but that fall I did populair with ORR and was hooked. After actually riding an event I started to understand how randonneuring worked. In 2008 I rode my first brevets. 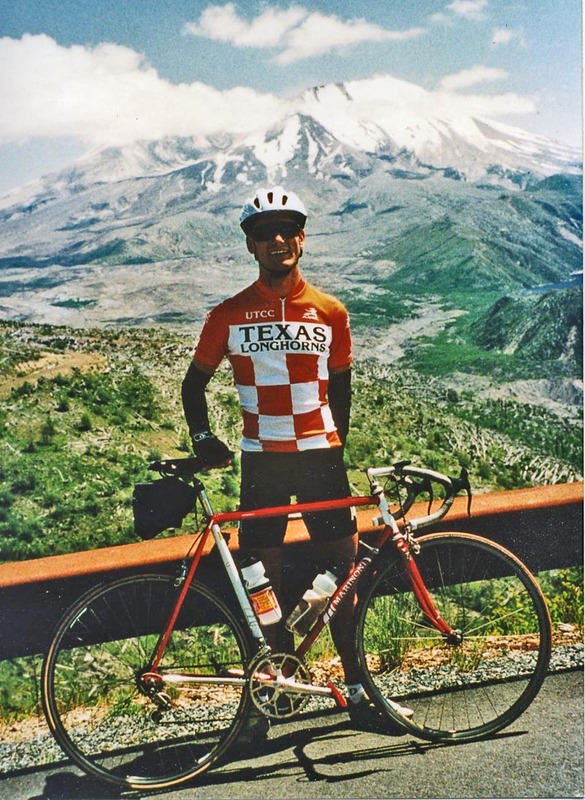 That year I completed 200k, 300k and 600k brevets with no problems. Due to scheduling issues with work I missed the 400k and wasn’t really motivated to become a “super randonneur”. I just wanted to ride my bike and have fun which is exactly what I did. Since then I’ve completed 2 SR series and am gearing up for another this year. I still haven’t done a 1200k but it’ll happen. Family obligations have kept me from doing the Cascade 1200k. For the last two years I’ve randonneured on a Rivendell A. Homer Hilsen. While it isn’t specifically designed for randonneuring with ideal trail it’s still been a more than capable bike that has served me well. I’ve also used this bike to complete numerous camping trips and two short tours. It’s a great all-rounder and I love it. For brevets I’ve used Berthoud fenders and HB bag which have been adapted to the frame although don’t come together on it as well as they would on a dedicated rando bike. Joshua Bryant is actually building me a dedicated 700c rando bike which I’ll ride this year. I’m looking forward to having a dedicated rando bike designed to accommodate a HB bag and metal fenders . Although Joshua is just starting out as a frame builder I trust him. He’s a friend and an accomplished randonneur who I’ve ridden a number of brevets with. The bike he just built for himself is beautiful. That said, I just got in from a ride on my Hilsen which currently sports platform pedals, a rear bag, plastic fenders and heavy Schwalbe tires and it just feels like the most perfect bike I’ve ever had. If I didn’t have the bike from Joshua in the works I would not hesitate to ride the Hilsen for this year’s brevet series (with some changes…SPDs, Bethoud fenders and HB bag).